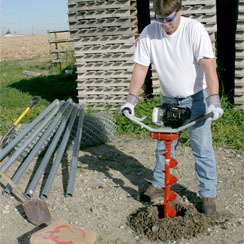 The first one-man hole digger to feature an all-position 4 stroke gasoline engine. Operate on the side of a hill, or store on its side without fear of damage or oil leaking from the crankcase. No mixing oil with gasoline or the need for two gasoline cans. The Comfort-Zone® operator handle helps maximize leverage and control, which reduces fatigue while increasing productivity and job site safety. 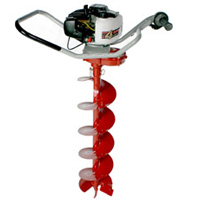 utch: 3″ (76mm) diameter all-metal automatic-centrifugal, slips on overload.